Digital menu boards are electronic displays of menus, typically found at quick-serve restaurants, coffee shops, and service-based businesses. 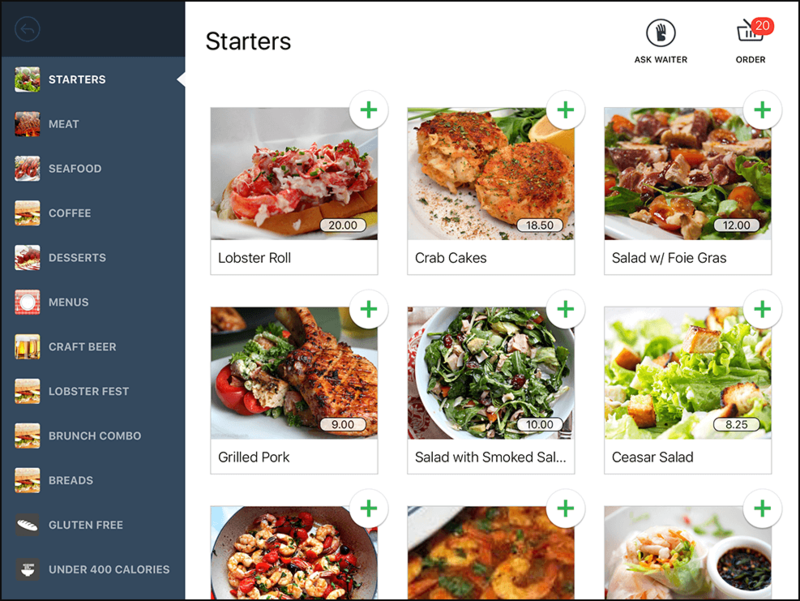 It’s an easy way to show customers opportunities for upsells, calories, and prices. The ongoing cost for software and hardware could be as low as $20 per month after the initial, sometimes expensive investment of screens. Mira Screen Signage includes easy-to-use hardware that connects to your TVs and internet at your store. Use the online dashboard to control the content that displays on your screens. There’s a 30-day money-back guarantee from Mira, so you can try it to see if it’s right for your business. Sign up with Mira. 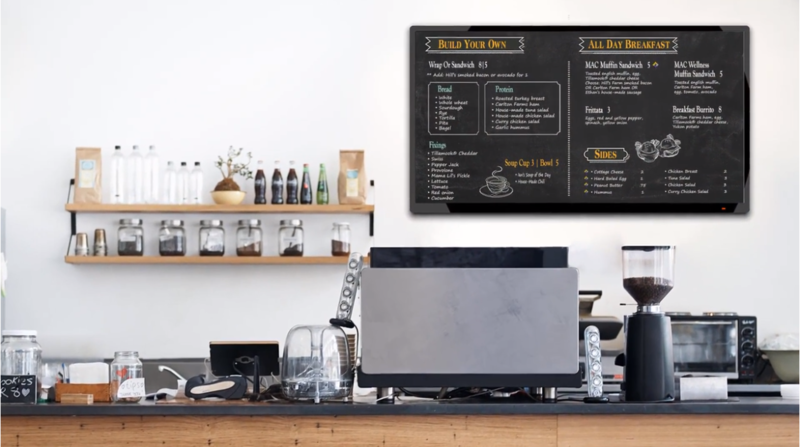 To make a digital menu board work, you need at least four components: a monitor or television, internet connection, media player, and software to turn that screen into a digital menu. It’s a bit like hooking up a Roku to your TV at home. As your menu or prices vary, you can make changes to your digital menu board through the online dashboard of the software you choose, and the updates are immediate. A digital menu can also be used to display different menus at different times of day, which is a great solution for a quick-serve restaurant that serves breakfast, lunch, or dinner with different menus for each at different times. Changing a price or menu item is easy to do from Mira’s online dashboard. A digital menu board requires a few key components to work, and then there are the peripherals, such as software and graphics. If you want to avoid installation fees, the do-it-yourself method only requires you to know how to mount a television on a wall and plug in a few devices. Here’s what you’ll need to get your digital menu board started. You’ll need to decide how many screens you want to adapt to use as digital menu boards. Many fast-food franchises have a row of monitors behind the counter placed high to allow all customers to see the various menus. How many you need depends largely on the size of your menu, what you want to display, and how much space you have. For reference, check out a local McDonald’s, and you’ll usually see four to six screens. Many digital signage companies provide the hardware needed to display content on your screens. Often, the cost is factored into your monthly fee, or you’ll pay upfront. The alternative is to buy your own hardware from electronic retailers. The small devices are essentially media players that connect through an HDMI port. Theoretically, you could use a computer to do the same thing, but these devices are small, inexpensive, and convenient. To ensure your content reliably shows up on your displays, you’ll need to have a stable internet connection. Most digital menu systems should connect through an ethernet cable or Wi-Fi. The media player also needs a power source. The program that drives your menu and content is one of the most important elements, and you have many choices here. Some software requires you to create your own graphics and menus while others like Mira include premade menus and other content from which you can choose. The templates are easy to use, and you drag-and-drop each element to each screen. 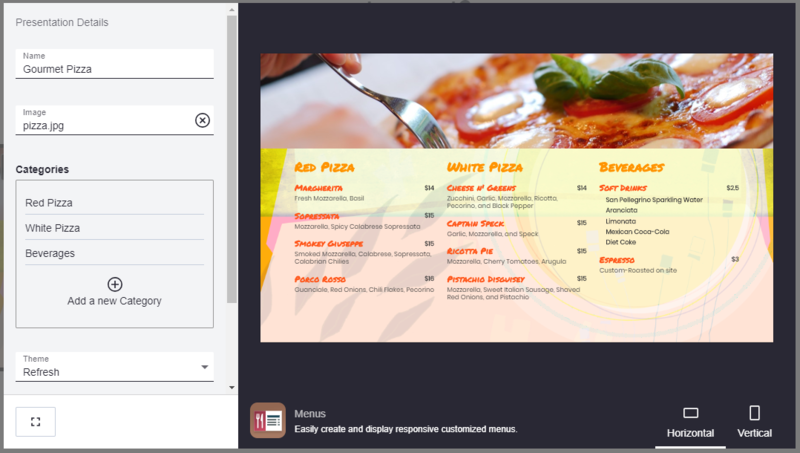 If you have design experience or a designer working for you to create menus and other content for your digital menu, you can upload your own images, menus, and other information to the software. Alternatively, a digital signage company may provide you with the images and content you need. You could also hire a designer from Fiverr to create only what you need. Changing prices or menu items is a simple process in most software, so you likely won’t need more than a freelancer to create the graphic elements needed. Sign up for free. A restaurateur is an obvious target for digital menu boards, but they aren’t the only ones who can make use of them. There are plenty of other industries that can make good use of digital displays with menus, content, or other information. Whether you want to inform, market, or entertain, a digital menu board is an excellent way to do it. It’s a good solution for almost any industry that needs to communicate with their customers more effectively, and in a way that’s dynamic and expected in today’s tech-forward society. There are a few different costs associated with digital menu boards, but you can expect to pay about $400 to $1,700, for a single digital menu board, with all components considered. You can piecemeal together what you need by buying media players and displays yourself, but you can also purchase equipment packages for convenience. The cloud-based software is typically a separate cost, and it’s usually a monthly deal, which often includes easy-to-use content management system, templates, graphic elements, and customer support. Installation of equipment may be another cost. Implementing digital signage can be an affordable upgrade from the paper or plastic sign solution you have now. If you’re outfitting your space with multiple screens, it could be a sizable investment, but it should pay for itself within the first year, as you’ll save on printing, time, and better potential for upsells. 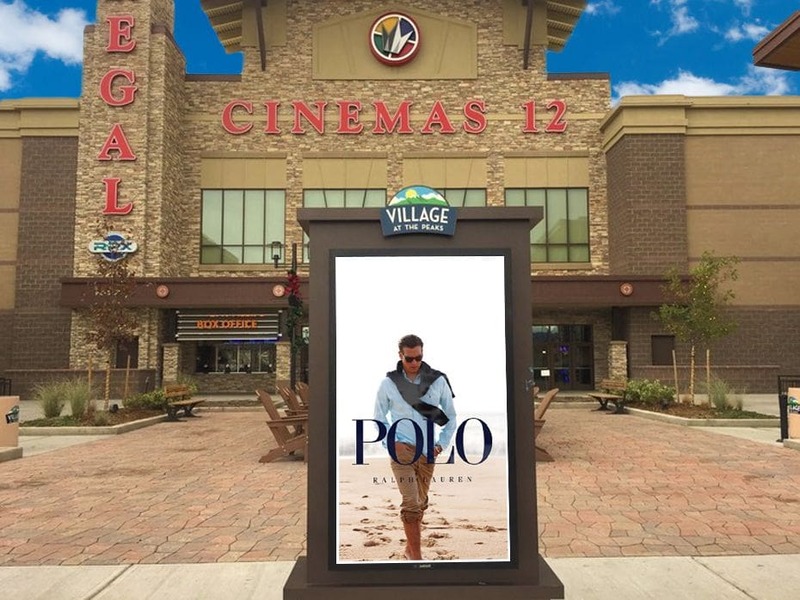 Average sales could increase by 3% to 5%; 20% of customers say digital signage influenced an unplanned purchase, according to Eclipse Digital Media’s report. A digital menu board doesn’t have to be used strictly for menus, and some are meant specifically for outdoors, wayfinding, or even to encourage guest interaction. Specialized digital displays may be pricier, but the opportunity to draw a new crowd to your store could be worth the investment. As technology improves, businesses begin to adopt what seemed out of reach. The next big thing in digital menu boards could go beyond interactive screens and toward augmented reality. 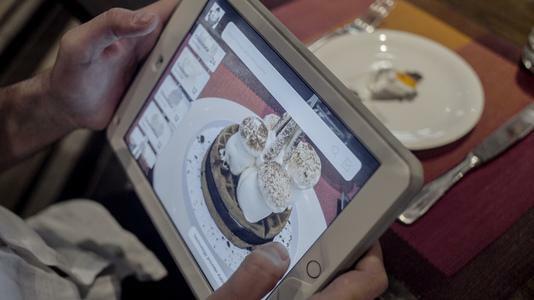 One company is already providing restaurants a way to display menu items in 3D (more on that below). Digital menu boards can be pieced together by buying screens from your preferred retailer, and then acquiring cloud-based digital menu software. The media player comes as part of a software package with some, while others require you to purchase it separately or from one of the provider’s partners. Here are the various digital menu board software options you should consider. Mira has low-priced month-to-month, one-year, or two-year contracts that start at $20 per month, per screen. The package includes a media player for each screen you sign up for. You’ll get access to templates, weather and news apps, and more. It’s easy to schedule the content you display on your digital menu board with Mira Signage. Reach offers a package that includes a media player you buy outright, and a monthly subscription to access the software that controls your content. 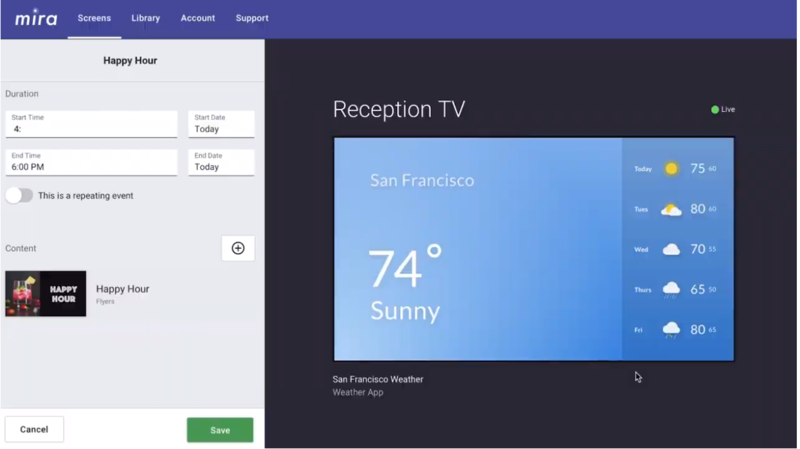 There are several templates from which to choose, plus widgets you can incorporate to display the time, weather, videos, counters, pricing, and more. Create chalkboard-like menus on a digital menu board faster and easier. Empower your customers with tableside ordering. Using iPads you buy separately, you can use the Lightspeed Restaurant software to display digital menus at each table. The touchscreen makes it possible for customers to interact with the menu to see photos of food, and order food themselves. Lightspeed Restaurant makes it simple to offer each table a self-ordering menu on equipped iPads. Like Reach, Enplug offers media players for you to buy outright. You have your choice of a monthly or annual plan, and you can theoretically get up to 1,000 screens supported. Pricing starts at $130.50 per month per license, but there are deep discounts when you choose multiple screens. Two screens come to $85.50 per month, per license if paid annually. Digital menu boards can also be used for third-party advertisements, directories, and wayfinding. One of the latest technologies in digital menu boards is 3D food. Kabaq is bringing augmented reality to food menus in restaurants like Bareburger and Magnolia Bakery. Customers can view precisely what their food choice will look like before they order, which could lead to more sales and more word-of-mouth advertising. Jump into the future with 3D and augmented reality digital menu boards to wow customers. While a digital menu board is typically used for restaurant menus — specifically in quick-service restaurants — it can be modified for retail, corporate, hospitality, spas, salons, and many other industries. The features of digital menu software are flexible enough to allow you to use images, designs, and more to make it work how you need. When it comes to the pros and cons of digital menu boards, the positives stack up quickly. The statistics on digital display back this list up too. Using a digital menu board can help drive sales, they’re more convenient, and you can display calorie counts easily, which is required in some cases. Yes, it’s a pricier option than print, but it’s an investment. Outages: If your internet connection goes out, your menus are down; it’s a good idea to have a mobile hotspot ready to go as a backup, but this could come with extra costs as well. A digital menu board can be used to bring your restaurant, retail store, or other business into the 21st century. It’s a convenient, easy, and relatively affordable solution to the static menus, directories, maps, and in-store advertising you currently have. Mira Signage offers a package that includes a media player and the cloud-based software you need. All you have to do is procure and install the TVs. The digital menu board provider offers a 30-day money-back guarantee. Try Mira risk-free today. They also give you the higher ROI and helps in increasing the customers for the store.